Last week, Facebook launched the messenger chatbot platform, which like Slack, Telegram and others, presents a big market opportunity for startups to innovate. In addition, the companies and products that determine how to most efficiently distribute their product on these new platforms will benefit from user curiosity and less competition, both of which result in lower cost-of-customer acquisition. How much infrastructure will the platforms offer on top of their platforms? Aside from the APIs to push and pull data, will the platforms offer NLP, sentiment analysis, predictive response scoring to help application developers build better experiences? In exchange for distribution, access to the platform and potentially some of the services above, how will the platforms tax applications? Will a 30% transaction tax exist as on iOS? When we type queries into Google, we write in a different language dialect than when we chat or write email? Will we change our language to suit these bots, particularly as artificial intelligence begins to respond to an increasing number of our inbound messages? how will use cases of chat bots evolve over time? 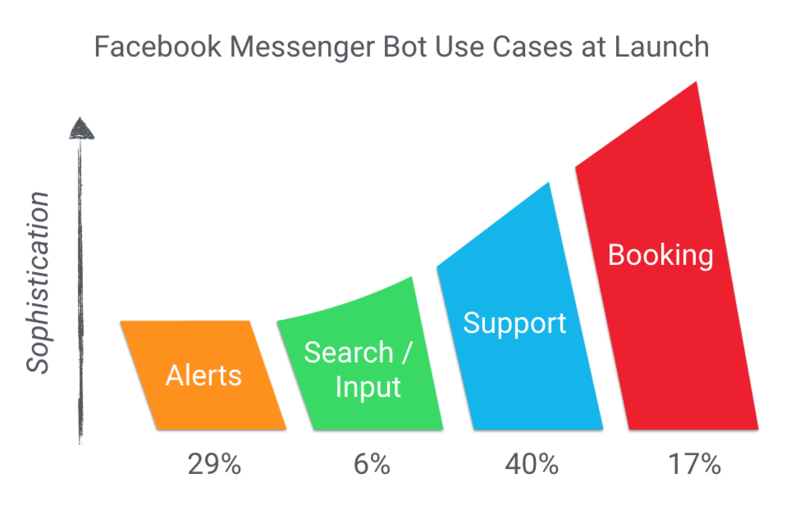 facebook’s initial launch partners’ bots fall into four categories: alerts, search/input, support and bookings. alerts are notifications of news, events, account updates. search means searching for movie showtimes or finding a customer record; input could be updating a crm record. support is talking to a vendor’s support team by chat. bookings bots enable customers to buy products or services through chat. alerts and support are the most popular today, as the chart above shows, because they are the most obvious applications. will social bots microsoft’s like xiaovoice and tay in some form or another take off? will bots be products in and of themselves, or will they be one of many interfaces to a standalone web app? What will the primary methods of distribution be? Will paid bot distribution manifest itself somehow and replicate some of the behaviors of the pay-per-install market of the mobile world? Can bots be viral? New user experience and distribution platforms come around perhaps once every ten years. Bots have the opportunity to create a discontinuity in the market. It’s going to be enthralling to see all the innovation that founders and startups will bring to this market.